Our clients can avail durable and quality Zinc Wires, which are manufactured using high grade metals such as lead, tin, iron and copper. Our wires are tested at our quality control unit in terms of heat and rust resistance, thickness, length and strength before the final dispatch. Our range is packed in quality material and is delivered within committed period of time. 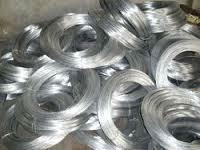 We are a proud supplier of a comprehensive range of Scrolled Zinc Wire, which is available in desired sizes and power. Based on long experience in producing ZINC WIRE of top quality ( High Grade) in all common diameters and packaging for the flame- & arc-spray process.